Fall temperatures are floating in but the garden still yields a summertime bounty—what better time to make some late-summer comfort food? Lucky, then, that Brookline restaurant Mei Mei just offered a few recipes to preview its forthcoming cookbook, Double Awesome Chinese Food: Irresistible and Totally Achievable Recipes from our Chinese-American Kitchen. Among the free recipes is the double awesome itself, that classic hangover helper of a scallion pancake-pesto-egg sandwich; and yu xiang eggplant, a perfect side dish to straddle the seasons. 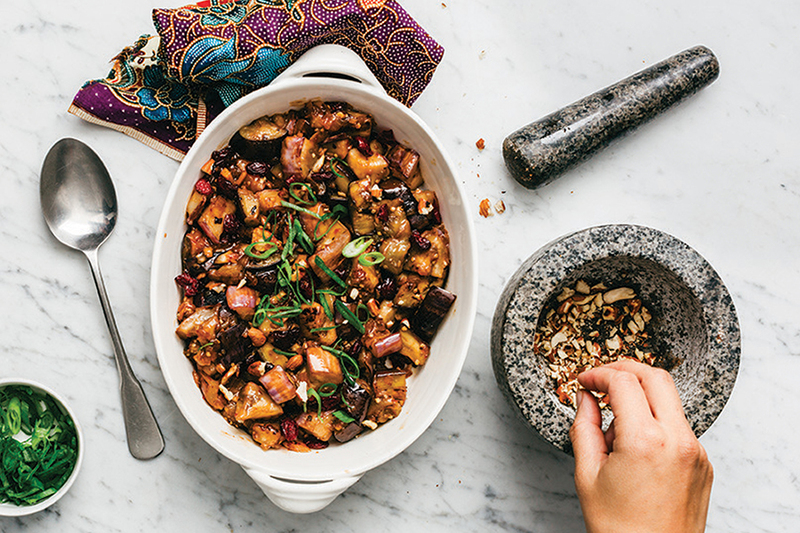 A take on founders Andrew, Irene, and Margaret Li’s mother’s favorite traditional dish, Mei Mei’s yu xiang eggplant is updated with punchy dried cranberries and crunchy almonds. It’s indicative of the recipes included in the sibling entrepreneurs’ first tome, coming out February 5, 2019, via Roost Books. 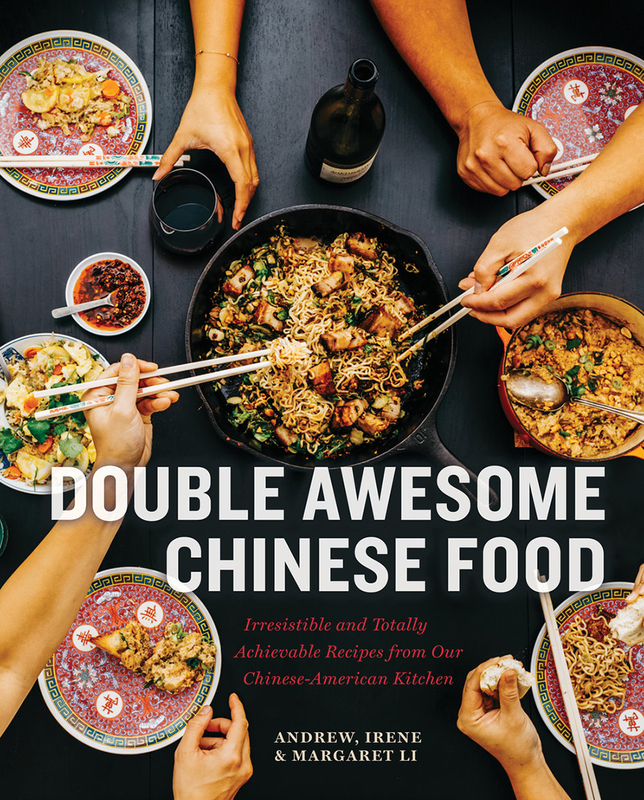 Double Awesome tells the Lis’ story of family and feasting, which started in the Boston suburbs with two parents working in the medical field, they write in the intro. Special occasions revolved around food, from folding dumplings for dinner to gathering around banquets at Chinese-American restaurants. 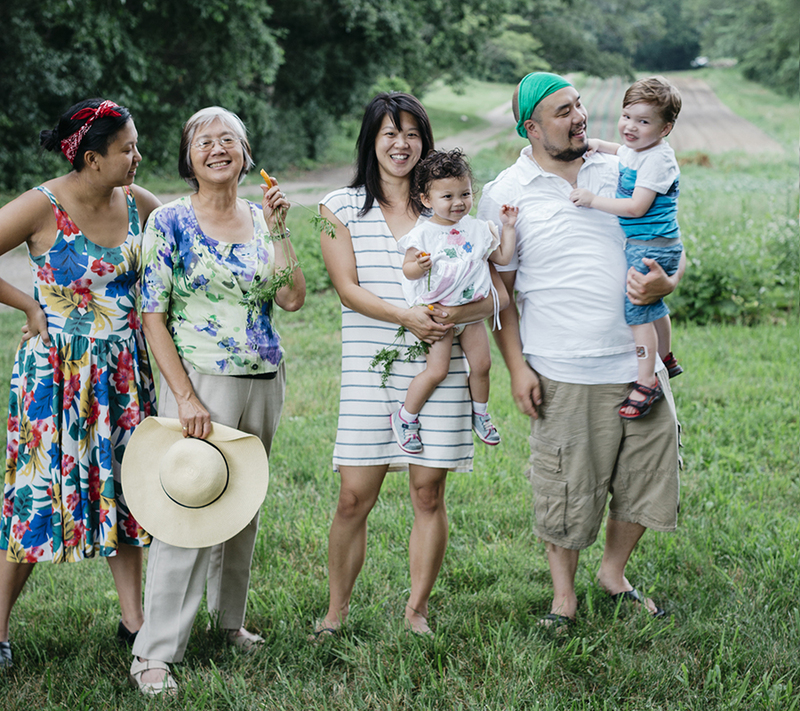 The recipes on the menu at their Brookline restaurant and in the book reflect these memories, combined with the chefs’ love of regional ingredients and cross-cultural pursuit of deliciousness. The chapters are broken down into more than 100 recipes for pantry staples, like Mei Mei’s apple hoisin sauce; Chinese Classics the Mei Mei Way; Dumplings and Pancakes; seasonal vegetables, grains and noodles, meats, seafood, and drinks and desserts. Along with pro cooking tips, personal stories, and sustainable sourcing advice, there are also gorgeous photos by Michael Piazza. Double Awesome is available now to preorder, but the PDF preview is downloadable today for just the price of an email address. While you’re looking to add to your personal library of culinary books, don’t miss the top Boston-connected releases from the past year, including Myers + Chang at Home, and Kristen Kish Cooking. Plus: Northern Hospitality with the Portland Hunt + Alpine Club: A Celebration of Cocktails, Cooking, and Coming Together is now available. The Hunt + Alpine Club owners Briana and Andrew Volk are celebrating the book, and a five-year anniversary, tonight with guest bartenders—including PDT’s Jim Meehan, Leyenda’s Ivy Mix, Bar Mezzana’s Ryan Lotz, Drink’s Ezra Star, and more—on the Portland bar from 5-10 p.m.
Mei Mei, 506 Park Dr., Boston, 857-250-4959, meimeiboston.com.